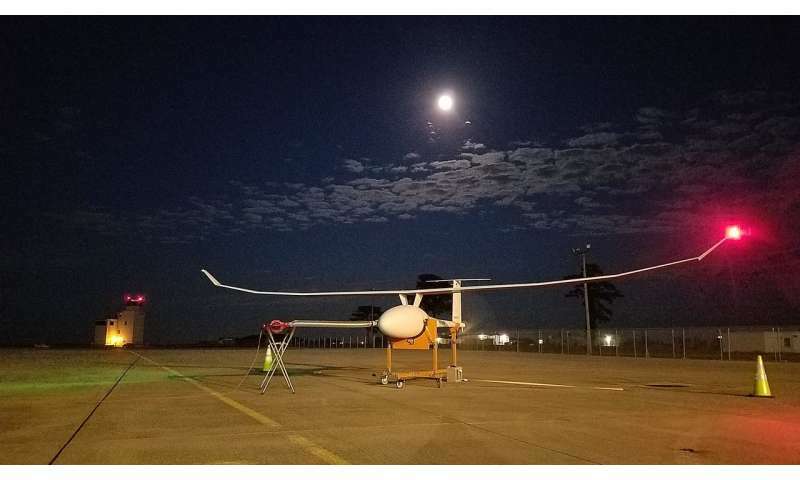 NASA scientists, who always are on the hunt for new platforms from which to carry out their research, now may avail themselves of two agency-developed unmanned aerial systems, or UASs, that some say represent the future for drone aircraft. Unlike most commercially available unmanned aircraft systems, Vanilla Aircraft's VA001 and Black Swift Technologies' S2 small Unmanned Aircraft System, or sUAS, purposely were designed for scientific investigations. Both provide one-of-a-kind capabilities that represent a significant success for NASA's Small Business Innovative Research, or SBIR, program, which funded their development, said Geoff Bland, a research engineer at NASA's Wallops Flight Facility in Virginia. "Our goal always is to advance state-of-the-art airborne capabilities and platforms tailored to the needs of our scientists," said Bland, who oversaw the aircrafts' development. "The SBIR program offered us an outstanding venue for engaging small businesses in our quest to develop new tools for gathering scientific data." Now operational after months of development, the aircraft are offering the scientific community complementary, easy-to-use capabilities at a lower cost. Vanilla Aircraft's VA001 provides a case in point. Smaller than NASA's Global Hawk unmanned aircraft, which requires a relatively large team to operate, the VA001 can carry 35 pounds of payload and fly at 500 to 15,000 feet above sea level. Its primary attraction—and the reason NASA funded its development through the SBIR program—is its ability to carry out research over the most forbidding locations on Earth. It can cover thousands of square miles of treacherous terrain and bone-chilling temperatures of -40-degrees Fahrenheit in a single flight. It runs on jet-grade fuel, which contains corrosion inhibitors and anti-icing additives crucial to operations in the Arctic or Antarctica. "It was an important part of the aircraft's design to fly under the toughest and coldest conditions," said Joe Famiglietti, the technology-infusion manager for Goddard's SBIR/Small Business Technology Transfer programs. Since NASA's initial SBIR investment in the aircraft's development, the Virginia-based Vanilla Aircraft has garnered support from the U.S. Department of Defense, or DoD, which funded a second prototype as well as test flights. In one non-stop test flight, the VA001 flew for 56 hours on a single tank of fuel, proving the aircraft could meet both NASA and DoD's needs, Bland said. "The dream mission would be for the VA001 to leave the Wallops Flight Facility, fly over Antarctica, and then return after two days of mapping the changing ice. We could do this on demand for quick response to changing phenomena over the poles," Bland said. The Colorado-based Black Swift offers a completely different set of capabilities with its sUAS. The company originally developed the aircraft to fit inside a vehicle trunk, take off anywhere, and fly up to 90 minutes over 705 acres, with a full payload. "The company did more than just develop a unique aircraft," Famiglietti said. The company also integrated a specialized radiometer developed by the University of Colorado in a partnership with Black Swift. Its miniature antennas are used to detect proportions of energy reflected from the objects over which the sUAS flies. Scientists can use the energy readings, along with other aircraft sensors, to differentiate between water contained within the soil or vegetation. With this data, NASA scientists can better understand soil-moisture levels and ground-truth NASA's Soil Moisture Active Passive satellite data that scientists use to monitor drought, predict flooding, and assist in crop productivity. Because the sUAS has a modular "plug-and-fly" instrument capability and can be toted to virtually any location, its use is not restricted to soil-moisture measurements, however. NASA scientist Miguel Román at the Goddard Space Flight Center in Maryland now is using the sUAS to map vegetation and climate dynamics under a pathfinding mission called MALIBU, short for the Multi Angle Imaging Bidirectional Reflectance Distribution Function sUAS. In 2016, his team integrated MALIBU's two multispectral imagers onto the platform at different angles to precisely match the viewing geometry of polar-orbiting satellite images. It proved so effective that he and his team have acquired a second platform, Román said. The aircraft is continually evolving, and will be able to observe volcanic plumes in the future, said Black Swift Founder and Chief Executive Officer Jack Elston, a MALIBU partner. "Through NASA's SBIR program, we are enabling new types of science," Bland said. "These aircraft represent the future."